George Elmore was born in the Witton district of Northwich and could reasonably be considered Altrincham's first 'star player', a centre or inside forward, Elmore was quick and skilful with fast feet. Broadheath’s committee had long desired his services for some seasons, based mainly on outstanding performances against the Broadheath team for both Witton Albion and Northwich Victoria. A labourer in the Northwich salt trade, his early career was spent playing with local sides, Witton Villa, Northwich Victoria, (1897/98) and Witton Albion. At Witton he established himself as a skilful forward. In 1900/01 he was part of a side that were runners up in both the Cheshire Senior and Junior Cups but also won the Crewe and District Cup. Witton and George went one better when they won the Cheshire Senior Cup the following season (1901/02), when Witton beat Sale Holmfield, 2-1, in the final, with George scoring one and hitting the cross bar. George finally joined Broadheath early in the 1902/03 season and was immediately, without any doubt, proved to be Broadheath's best player. So, it was no surprise that within a couple of months he had trials at Manchester United in December 1902 before Division 1, Football League side, WBA, paid the princely sum of £10 for his services in January 1903. The money was much needed as the Broadheath committee were struggling for funds but the effect on the playing side, in the short term was disastrous, as the team had lost its cutting edge and results, throughout the rest of the season, were relatively poor. George, however, appeared to thrive, scoring on debut for the reserves at WBA but he was to find it a struggle to make the first team during the 1902/03 season. The Committee acknowledged at the AGM that Elmore's departure had been the main cause of the poor results in the latter half of the season. George eventually made his first team debut for WBA on the 11th February 1903 in a 2-0 FA Cup replay defeat against Tottenham Hotspur, closely followed on February 14th by his League debut at the Hawthorns, when he scored on debut in a 3-3 draw with Sheffield United. That however did not guarantee a first team start and it was not till 21st March that he played his next game, a 1-0 defeat away to Blackburn Rovers. George’s final game was in a 3-0 defeat against Stoke City in April. George finished the season having played only 3 league and 1 FA Cup match and scoring once during the season. Deemed surplus to requirements at the Hawthorns, George then moved to Bristol Rovers, (then in the Southern League), in August 1903 for a fee of £40. The 1903/04 season, proved reasonably successful with George playing alongside former Wolves and England centre forward, Billy Beats, who finished the season as leading scorer with 18 goals. George’s contribution was 5 goals in 21 league games. In addition he played in all three FA cup ties against Arsenal, Rovers eventually going out after a second replay, 1-0, with the game played at neutral, White Hart Lane. Unfortunately, a serious leg injury curtailed this part of his professional career and he returned north to briefly rejoin his local side, Witton Albion before re-joining Altrincham in November of the 1904/05 season. George became the 'spark' that ignited Altrincham’s first period of success and marked his second debut with two goals in a 3-1 home win over Buxton. He scored regularly throughout the season, including a ‘hat trick’ in a 5-3 away win at Oughtrington Park, and finished the season by winning the Cheshire Senior Cup and Manchester League 'Double' in addition to being Manchester Junior Cup runners up. George was the player who orchestrated Altrincham’s performances, primarily from inside right but occasionally playing on the right wing or even at centre forward. The key thing was that he delivered when it mattered; for example, he scored the only goal in a close fought Cheshire Senior cup semi-final replay against Stockport County when a 0-0 draw and another replay seemed the most likely outcome. George also collected his second Cheshire senior Cup winner’s medal when Altrincham beat Chester, 2-0 at The Drill Field in front of 5,000 spectators. 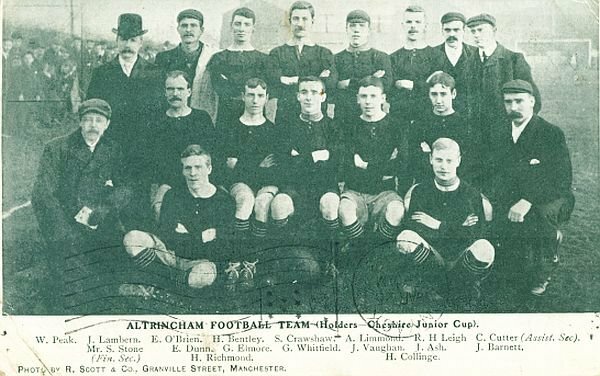 Altrincham romped to the Manchester League title, losing only one league game after January 7th, with George finishing the season as top scorer. The following 1906/06 season was a personal triumph for George, as he yet again topped the goal scorers' list, with the highlight being four goals in a 6-0 win over Newton Heath Athletic. The Altrincham team were not able to recreate the previous season’s success, finishing third in the League and going out of the Cheshire Amateur and Manchester Junior Cup at the first round stage and the Cheshire Senior Cup at the semi-final stage, Stockport County gaining revenge for the previous season's exit. For 1906/07 George was made captain, after Andrew Limond’s retirement due to injury. He presided over an Altrincham side that made their debut in the FA Cup, (a 5-2 defeat at Bryn Central, with Elmore scoring both Altrincham goals). The triumph though was winning the Manchester League title for the second time in three years, Elmore leading the way with nearly thirty goals and topping the goal scoring lists yet again. For the 1907/08 season Elmore retained the captaincy and picked up where he had left off the previous season as Altrincham looked set for more success. The problem was that George was a class above his team mates and it was no surprise in October that he was persuaded to re-enter professional football with Second Division Glossop, signing off for Altrincham with two goals in a 4-1 win over Salford United. George marked his Glossop debut on the 26th October by scoring against former club WBA in a 2-1 win and was a near ever present during the remainder of his first season scoring a total of 8 goals in 24 League games. For the following season Glossop signed amateur international Harry Stapley, a transfer that relegated George to the role of deputy but, despite the ‘bit part role,’ he still managed 6 goals in 11 league matches. At the end of the season he moved to Blackpool for 1909/10 and played 34 of the maximum 38 league games and scored 6 goals as Blackpool finished in 12th place in the Second Division. His next move was north of the border to join Scottish First Division side, Partick Thistle, for the 1910/11 season. George had a successful season scoring 12 league games in 32 League games and in addition scored 4 cup goals, including a hat trick in a 7-2 win over St Bernard’s in the Scottish Cup. The following season was less productive with George scoring 6 goals in 20 league games, with an additional goal scored in the Glasgow Cup competition but he also was part of the side that reached the final of the Glasgow Cup against Rangers, a match Rangers won 1-0 and played in front of a crowd of 58,000. In June 1912 George moved to Scottish 1st Division rivals, St Mirren, having scored a very creditable 24 goals in 65 games in all competitions for Partick Thistle. Seasons 1912/13 and 1913/14 seasons were relatively productive for George but St Mirren were struggling and, at one point during the 1913/14 season, spectators not only hurled abuse at the players but rocks and stones, to the point that police had to be stationed in front of the main stand on match days! During 1912/13 season George scored 9 goals in 34 league games and played in 4 Scottish cup games, scoring 3 further goals. The following season, (1913/14), with the team struggling to avoid relegation, George played 28 1st Division matches and scored 8 goals and played in 4 more Scottish cup games, failing to score in any of them. Although still on the books at St Mirren for the start of the 1914/15 season, the committee had brought in a number of new players and he, along with a number of players from the previous season never came close to playing for St Mirren again and eventually he drifted back to Northwich. With the war intensifying, George was one of 550 men who enlisted in the Royal Scots 15th Battalion, signing on at Northwich in December 1914. (The Battalion was sometimes referred to as ‘The Manchester Scottish’ and was first raised in September 1914). After enlisting, George returned to Scotland and whilst posted to the garrison briefly turned out for St Bernard's of the Eastern League, (playing 4 games and scoring once) before moving to fellow Eastern League side, Broxburn United in October 1915, where he played occasionally until the Battalion was eventually shipped to France, landing in La Havre in January 1916. Sadly, Lance-Corporal George Elmore was killed in action on July 1st 1916, the first day of the Battle of the Somme, a day when British forces took the heaviest casualties ever with nearly 60,000 men killed or wounded in a single day. He was 36 years old and is commemorated on the Thiepval monument in France. George Forrester only played one season at Moss Lane but, in that one season, he captained an Altrincham side that won the Cheshire County League title for the first time. Whilst Jack Swindells and co were knocking in the goals, George was at the other end helping to stop the opposition scoring. Born in Glasgow, George joined the Raith Rovers youth team before signing for Sunderland on the 2nd March 1953. Failing to break into the first team, he was released in June 1954 and rejoined Raith Rovers in August. Two years later and, still to play a first team game, he joined Dundee. Once again failing to make the first team, he joined Brechin City on 26th September 1957 but left on 30th November, having played just a single first team game. In February 1958 he joined Dundee United, where he made a total of nine first team appearances before once again being released. He joined non league, East of Scotland league, Eyemouth United during the 1959 close season and played in the side that surprisingly made it to the quarter finals of the Scottish Cup before being knocked out by eventual winners Kilmarnock. With opportunities for progressing, George was lured south just before transfer deadline day to join Accrington Stanley on 16th March 1960, making his debut three days later against Bury. George had found his niche, making 87 consecutive league and cup appearances for Stanley before their unfortunate demise 2 years later, (Altrincham team mate Pat Connolly was in the opposition Crewe side that played against Accrington in their final match in March 1962). Later that month, George moved on to Sankeys to finish the season and three seasons later joined Altrincham for the 1965/66 season, along with team mates, fellow full back Jimmy Brown and midfielder, Frank Peters. The main reason being that Sankeys, who had finished second in the Cheshire League in 1963/64, had withdrawn from the Cheshire League at the close of the 1964/65 season to join the weaker West Midlands League. Tall, solid, well built, with a reputation as a hard tackler, George was appointed Altrincham captain, making his debut in the season’s opening fixture, a 2-1 away win at Rhyl with George assuming the left back position, a role he would fill for all but 4 games of the season, playing 59 games in total. (George’s full back partner Jimmy Brown played all 63 games, as did former Sankey’s teammate, Frank Peters). Apart from winning the league title, Altrincham also reached the two-legged Cheshire League Cup final, losing to Wigan Athletic but, above all else, this season was memorable for Altrincham’s progress through to the third round of the FA Cup for the first time in the club’s history. After beating Scarborough and Rochdale in rounds one and two, the cup run culminated in a third round against Wolverhampton Wanderers, which Altrincham lost but by no means disgraced themselves. Surprisingly George, a motor mechanic by trade, was allowed to leave Moss Lane at the end of the season and join local rivals, Macclesfield for the following season, where he was part of a side that won the Cheshire League cup and went on to play 79 Cheshire League games and 33 cup games, scoring twice in the league and once on cup games over the final two seasons of Macclesfield’s time in the Cheshire League. The 1968/69 season was George’s last as a player and Macclesfield’s first in the new Northern Premier League, with George playing 27+2 League games and 14 cup games in a season that saw Macclesfield become the first NPL champions and in addition win the Cheshire Senior Cup. On retirement he took over the running of the club's Moss Rose Hotel. Famous for his one outstanding season at Chester in 1930/31, Arthur started his professional career at Bury after playing for Salford Lads and Sedgley Park in Prestwich. He made his debut in a 1-1 draw at Aston Villa on March 2nd 1926. His next game saw him score both goals in a 2-2 draw with Arsenal and he ended the season having played five First Division games, as Bury finished fourth in the table. 1926/27 saw him manage another three games as Bury slipped down the table, finishing 17th. In 1927/28 he played four more games as Bury finished 5th. 1928/29 proved Arthur’s most productive as Bury slid down the table towards relegation, Arthur scoring 3 times in 26 league games, (most as outside or inside right). In addition he scored twice in three FA Cup games. In 1929/30 he dropped out of favour and made only one appearance before being allowed to move to Chester for the 1930/31 season. The 1930/31 season was something of a sensation with Arthur scoring over 100 goals in all competitions including 71 in the Cheshire County League. Chester scored 239 goals in all competitions. He started the season sedately, scoring on debut in a 5-1 win over Northwich Victoria, followed by goal in his next match, a 3-2 win over Witton Albion. By the end of September he had eight goals in eight games. October was to be prolific with Arthur scoring eight goals in a 10-2 win over Whitchurch, which was followed by a hat trick against Congleton Town, two against Witton and one against Hyde United. November saw him score two against Connah's Quay, five against Sandbach Ramblers and two each against Connah's Quay and Mossley, in addition to a goal against Winsford. In December Arthur went into overdrive starting the month with five goals against Manchester North End, five against Hyde on Christmas Day and five the on Boxing Day against Tranmere Rovers. In addition he scored two against Northwich and a further goal against Nantwi. No wonder Chester won eleven games in a row! January saw only three league matches played but Arthur still managed five goals and in February only two league matches were played but Arthur scored another five goals including four against Winsford United. March was relatively a famine with just a hat trick against Stalybridge Celtic but April saw further goals against Port Vale, Macclesfield and Mossley, a hat trick in a 3-1 win over Stalybridge and two against Manchester Central. He netted seventy-three Cheshire League goals in thirty nine matches, (in all, Chester scored 170 goals in 42 League games, Altrincham by comparison had scored 123). In the various cup competitions Arthur bagged seven in a Welsh Cup match against Llanfairfechan and a further goal against New Brighton and scored four more in the Cheshire League Cup. In the Cheshire Senior Cup Arthur scored a further seventeen goals, including hat tricks against Winsford and Nantwich, six against Congleton and four in the final, (6-1), against Crewe Alexandra. Chester were elected to the Football League at the end of the season and hoped to retain most of the side but Arthur was signed by newly promoted First Division Side WBA for £400, (his former club Bury received the fee, as due to the system of the time he was only technically ‘on loan’ to Chester from Bury). Arthur made his debut for WBA in April 1932 in 2-1 home win over Newcastle United and then played the next two games, without scoring. In 32/33 he played four first team games and scored his debut goal in a 2-1 away win at Chelsea. 33/34 was much the same playing just four games but scoring twice against Everton in a 3-3 draw and once again against Newcastle United in a 2-1 win. 1934/35 was his longest run playing 10 league games, scoring twice but he really shone in the FA Cup playing every game through to the semi-finals, scoring four times but was surprisingly dropped for the final, which WBA lost. In 1935/36 he played one solitary game, away at Chelsea, and scored WBA’s consolation in a 2-1 defeat. In 1936/37 Arthur played just 2 games and scored one goal (v Arsenal in a 4-2 defeat), before being transferred back to Chester in December 1936 and over 11,000 spectators turned up to see his first game back, a 1-1 draw with Halifax on Christmas Day 1936. Arthur finished the season scoring 5 goals in 18 Division three games in addition to scoring once in two FA Cup games and a goal in his only Division 3 North Cup appearance. 1937/38 showed that although not a regular Arthur still had an eye for goal with 11 league goals in 16 appearances. In addition he scored in his only FA Cup appearance, 3-1 defeat by Leeds United and played one Welsh Cup game. His final season, 1938/39, he played just one match for Chester in September before signing for Macclesfield Town in October 1938. Going straight into the side he was a near ever present for the remainder of the season. He finished the season as top scorer with 12 goals in a low scoring season, scoring twice in the home match against Altrincham and twice in both the home and away fixtures against Hurst. He joined Accrington Stanley for the 1939/40 season but managed only one game before the outbreak of war and regular football being suspended. Once the decision to form wartime leagues was made Arthur made himself available for Altrincham. Although now in his mid-thirties, Arthur was to show the sort of form he had showed at Chester in 1930/31. His debut game in late October was against Wigan Athletic at Moss Lane, Arthur scoring in a 7-4 win. He followed this with both goals in 2-2 draw with Runcorn. Poor old Timperley faced Arthur and Altrincham in the Cheshire Senior Cup and Arthur bagged seven goals as Altrincham won 9-3. Arthur's next two games were against his former club Macclesfield and he scored twice in each game as Altrincham won 4-0 away and 4-1 at home. Arthur finished the 1939 competition with four goals in a 5-5 draw away at Wigan Athletic. For the 1940 competition Arthur scored in each of the first five games and during the remainder of the competition scored hat tricks against South Liverpool and Northwich Victoria and two goals in the return match with South Liverpool. In all Arthur scored thirty three goals in just twenty two appearances. Arthur continued to work as a school teacher, eventually becoming headmaster at Lower Kersal Primary School, one of his pupils being the famous mountaineer Don Whillans, (who made the first ascent of the south face of Annapurna). Arthur’s involvement with football did not cease when his playing career was over and he became heavily involved with the amateur side, Northern Nomads but eventually returned to Altrincham as coach in July 1948 when he was appointed as reserve team manager. By 1949 he was also coaching the first team. Arthur resigned his position in February 1953 after a disagreement with the board about the way the reserve team were being handled. He later re-joined Altrincham in 1955 as assistant to new Altrincham manager, Jimmy Morris. Arthur’s work included scouting and he discovered a number of players who would go on to have Football League careers including Joe Kennedy, Brian Phillips, Bob Dale, Eric Robinson and Harry Williams; the transfer fees for these players helping to keep the club afloat in difficult times. He was well known for directing training from the main stand using a microphone, which at the time was regarded as quite revolutionary.